grondilu wrote: Thanks. With this I may be able to render the Coriolis station. And if I have a Coriolis station and the ships, I can do a big part of the gameplay in space. I'm very much confused by what happened to the 1.8+ cobra3. I need to think on it hard to understand what's wrong. Well, while looking into the cobra3 issue, I tried to run your Perl script against the oolite_cobra3.dat, but it seems you're using a Regex class not known by "my" Perl (on Cygwin64). 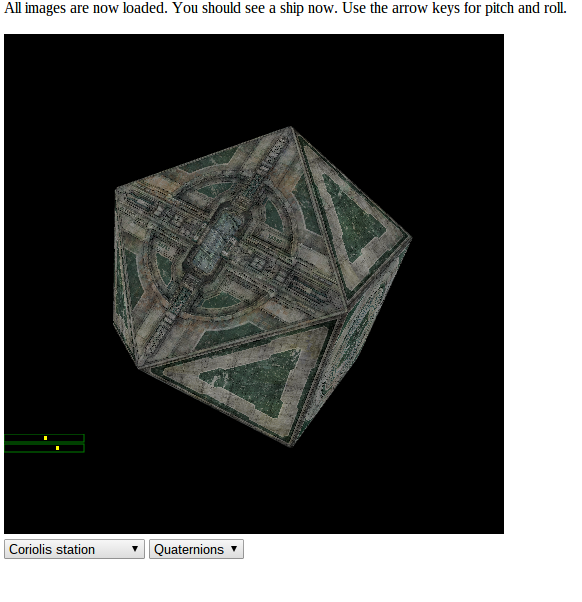 You might expect harder texturing times with the Coriolis (which has 3 subentities) as opposed to Cobra3. I had experimented a bit with the Coriolis and fusing the three parts should not be an issue. My main concern was the texture but your fragment shader will probably solve this. I had fun writing this Perl 6 script but it's very slow for large meshes so I will re-write it in perl 5. At some point I will have to add normals if I want to put light effects (and I do want to). But this makes me wonder : since there must be one normal per vertex, and normals are determined by faces, I have the feeling I will have to make sure no two faces share vertices. So the code I wrote was basically pointless : I can just make a new set of vertices from the faces (and I will always have exactly 3 times more vertices as I have faces). grondilu wrote: I had fun writing this Perl 6 script but it's very slow for large meshes so I will re-write it in perl 5. Yup, "perl --version" gives me "This is perl 5[...]". Commander_X wrote: The trick is the textures use alpha channel (I guess for emission or the sorts). Yes. To halve the number of texture files needed, diffuse is on rgb, and greyscale emission is on a.
grondilu wrote: I have the feeling I will have to make sure no two faces share vertices. So I added keyboard controls (arrow keys) for pitch and roll with the Euler angles method, and as expected I encounter difficulties with large angles. For instance if you pitch +90° so that your ship becomes vertical, then roll +90° so that you show its side, then pitching again does not rotate the ship in the expected axis (you get what would normally be a yaw). If I spend some time thinking about it I will eventually figure it out, but I'm going to be lazy and ask you guys how I do this using quaternions. where q_rot* is the complex conjugate of q_rot, i.e. with the i,j,k components turned negative. To do a pitch you would replace -k with i, and for a yaw you'd replace -k with j. Well, I failed but I get a weird behavior that is I think worth of showing, so I push the attempt anyway. 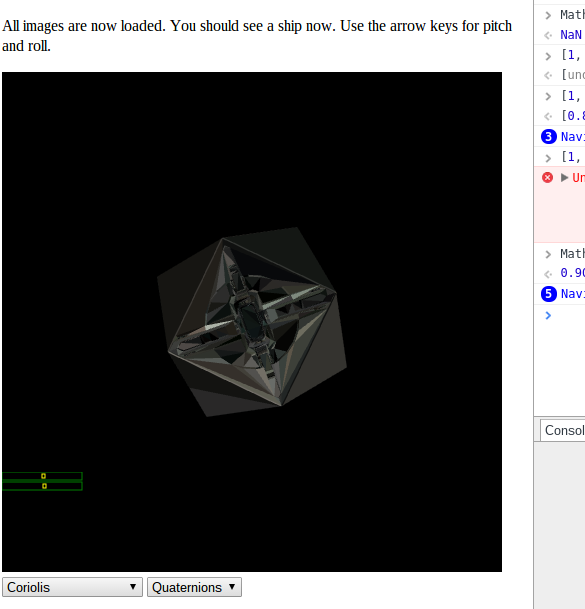 Pick the "Quaternions" option instead of "Euler" at the bottom. the first three lines are OK - you're calculating a rotation matrix from a quaternion, and then multiplying the model view matrix by it. But then you're multiplying by the inverse matrix in the second three lines. You don't need to do that, as the fromQuat effectively does the multiplying-by-the-conjugate bit of the quaternion recipe for you. So if you remove the final three lines of the above, you get rid of the weird effect, but you get back to the problem you were having with the Euler angles. That's because you're calculating the quaternion from the Euler angles, so you get the same problem. I'd try storing the orientation as a quaternion and manipulating that. Well, I've finally managed to do it but that was painful. And to be honest I still don't understand everything. 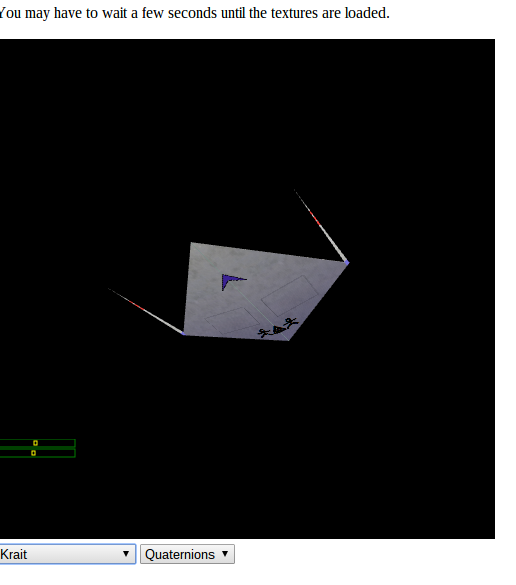 That was after I realized I should store the orientation of the ship in a global quaternion variable. But no, apparently it's different. The center of rotation keeps being the origin, not the ship. It might be useful here. The HUD is a superimosed 2D canvas. It's quite a natural choice since the HUD is supposed 2D graphics. It does not look too great, unfortunately. But that's OK for a first try, I guess. Notice that I had to adjust the Z component of the dock by 500 meters. Not sure why it was not connected to the rest of the model. grondilu wrote: Notice that I had to adjust the Z component of the dock by 500 meters. Not sure why it was not connected to the rest of the model. Note the non-zero position on the dock subentity. There are various internal implementation reasons which require docks to be subentities, and also generally mean that they will be offset subentities. Subentities can also be rotated relative to the parent model with the orientation quaternion. If I want to make progress at some point I will have to parse this file. I deplore the choice of the plist format. Any chance there is a convertor to JSON?